Dudu Myeni, journos in denial. What’s next as Agrizzi ends testimony? THREE JOURNALISTS were on the payroll of facilities management company Bosasa. Implicated. Former SAA board chair Dudu Myeni has been tainted by allegations of fraud and bribery at the Zondo Inquiry. She’s seen with former Pres Jacob Gehleyehlekiza Zuma, whose relationship was used to influence ‘dodgy’ dealings. This was revealed by whistle-blower Angelo Agrizzi at the 8th day of his appearance at the State Capture Inquiry headed by Dep Judge Raymond Zondo sitting in Parktown-Johannesburg. The Italian born and former CCO Agrizzi said the journalists who were allegedly paid were Pinky Khoabane, who previously worked for now-defunct Gupta-owned New Age newspaper. The other two were a “Bongs” from Eastern Cape and a “Ntuli” from The Star. He was unable to provide the full names for the two other individuals. According to him, of the R71 000 about R30 000 was to be used to pay journalists for positive stories on Bosasa and foiling attempts at writing negative stories about the company. Agrizzi said he was not present when the payments were allegedly made to the journalists and he relies on information provided by director and spokesperson for Bosasa Papa Leshabane. “At the time Bosasa was going through a rough patch regarding negative reporting from certain journalists. He said he could arrange some friends who could sway the reports on Bosasa and would also write positive stories on Bosasa,” said Agrizzi. Khoabane, one of the journalists said to have been paid a bribe, stated on her Twitter profile that she has never met Agrizzi and plans to appear before the commission to state her side of the allegations. I have never met Angelo Agrizzi. I simply reported on his racist rants and his links. I will make a submission to @StateCaptureCom. She also indicated she’s prepared to cross-examine Agrizzi. Also implicated was former SAA board-chairperson Dudu Myeni. 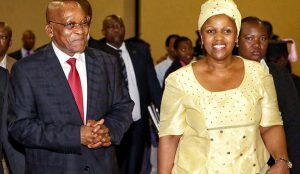 The controversial Myeni is or was the chairperson at the Jacob Zuma Foundation, and as a result used her influence to sway things her way, having had a close relationship with former president Jacob Zuma. She has denied ever meeting with Gavin Watson at the Bosasa offices, claiming that Agrizzi was lying and his “greed is worrisome”. During his testimony on Monday, Agrizzi detailed how National Prosecuting Authority (NPA) documents relating to a Bosasa investigation were allegedly leaked by Myeni when she met with Bosasa CEO Gavin Watson at the Sheraton Hotel in Pretoria. Agrizzi further alleged that Myeni was on Bosasa’s monthly payroll, receiving R300,000 a month as well as lavish gifts. According to Agrizzi, Myeni would call Watson to arrange “high-end” functions, including functions for then president Jacob Zuma. Agrizzi claimed that Myeni’s monthly payment was made in cash and he would often be tasked with packing it. The COO said he asked his wife to advise on a gift to impress Myeni and she suggested a Louis Vuitton handbag. Agrizzi said Watson stuffed R300,000 into the bag, which was then delivered to Myeni. Myeni has refuted the claims and said she’s consulting her legal team. Agrizzi ends his mind-blowing testimony today.